Three months membership is just £30. 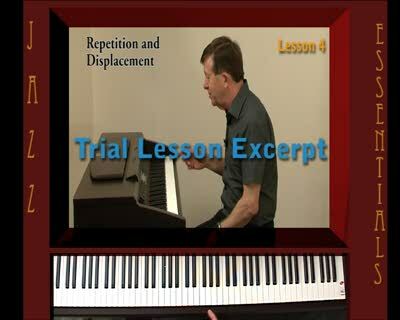 You will have unlimited access to this new and exciting approach to learning Jazz Piano with our online video tutorials. Learn to play Jazz Piano at your own pace. Only £30 for 90 days. Revisit whenever suits you, and develop your jazz playing at a time that suits you. Jazz Essentials is my method for learning to improvise from the basement up! Just as when you build a house you begin with laying the foundations, so in my Jazz Essentials you learn the fundamental building blocks for playing jazz. Each lesson builds on the lesson before and therefore your musical vocabulary will grow with the colours you acquire through understanding each concept before you move on to the next. Please, don’t be in a hurry – playing music is a lifetime’s work, and not something acquired without careful thought. Jazz Essentials series is the first of a range of tutorials that I have been developing and perfecting through years of instructing jazz players and teachers. My proven methods are now available to you, at home, through these new on-line tutorials. Enjoy the benefits of my teaching experience and if you follow the guidelines you will have at your disposal the tools of the improvisor, and have the knowledge to play a jazz solo..
Click here to register for yourJazz Essentialsseries. 10 lessons, over 30 videos, plus hints and tips. Develop at your own pace. Watch and Play along with me. Listen to my ideas and phrasing – then develop your own. I Play, You Follow. I play the backing chords while you improvise. Follow the notation on screen or print it out. Tommy Smith - "His educational dedication in the field of jazz over numerous decades has fueled the potential careers of countless young musicians." Tim Garland - "Richard's enthusiasm is infectious! I can think of no-one better to demystify the joys of jazz music." Peter Erskine - "Richard Michael presented one of the best jazz classes I have ever had the pleasure to witness: informative, fun and, most importantly, inspiring for all involved. I wish that jazz had more educators and advocates like Richard Michael!" Other programmes in the series are in production at the moment and will be live soon.